John Bunyan, best known for his enormously influential book, The Pilgrim’s Progress from This World, to That Which is to Come (1678), died on August 31 in 1688. The Folger Manifold Greatness exhibition, opening this September, includes this 1680 edition of Pilgrim’s Progress from the Folger Shakespeare Library collection. 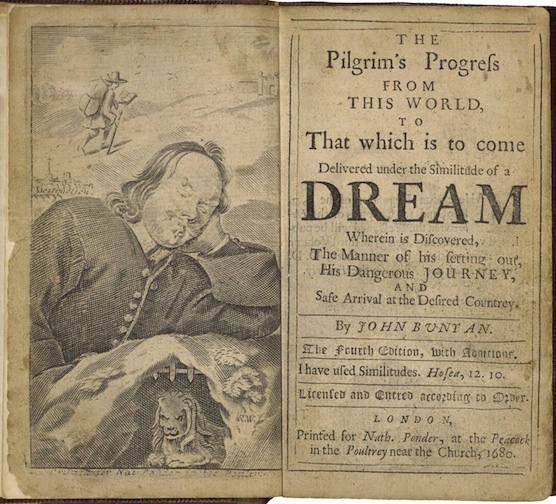 These pages put the emphasis on Bunyan (the large figure at left) and his “dream” of the pilgrim Christian’s journey. Christian is the small figure above Bunyan’s head. Learn more about Bunyan, the importance of Pilgrim’s Progress, and other works influenced by the King James Bible through the Literary Influences timeline at the Manifold Greatness website. John Bunyan. Pilgrim's Progress. London, 1680. Folger. 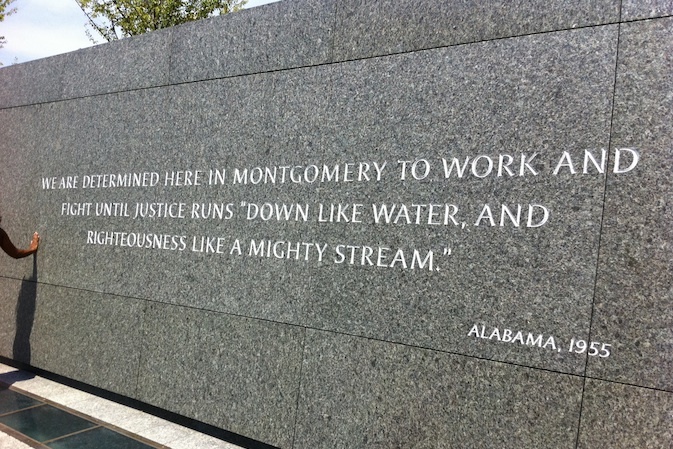 Martin Luther King Memorial, August 2011. Tomorrow (August 28) was to have been the day for officially opening the new and long-awaited Martin Luther King Memorial in Washington, DC. Hurricane Irene delayed these plans along with so much else. (Check the Memorial’s website for updates on the ceremony plans for the future.) August 28 remains, of course, the anniversary of King’s famous “I have a dream” speech from the March on Washington on August 28, 1963. 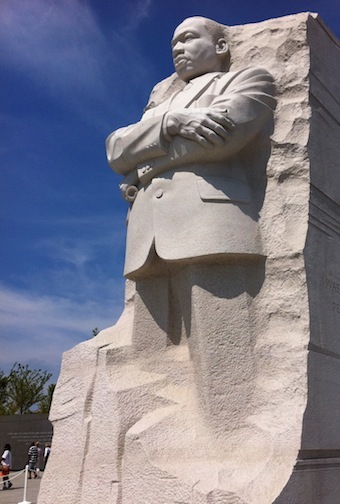 For the past week, the site on the Tidal Basin, on a direct line between the Lincoln and Jefferson Memorials, has been open to visitors, though, who could view the impressive sculpture by Lei Yixin and the many quotations from King’s speeches and writings engraved around the site. The Memorial has generated some controversy, first for the choice of a Chinese sculptor. It’s also been pointed out that one of the engraved quotations is broadly paraphrased rather than quoted exactly, and another, though spoken by King, was originally from a sermon given a century earlier by Theodore Parker. Be all that as it may, the sculpture, “The Stone of Hope,” looks impressive, though I’ve as yet seen it only in photos. The concept derives from a line in King’s famous “I Have a Dream” speech, delivered 48 years ago tomorrow, from the steps of the Lincoln Memorial. King said that with faith in the dream, “we will be able to hew out of the mountain of despair a stone of hope.” Yixin has shown King himself as a kind of stone of hope emerging out of the marble block. King’s language here, as so often, is deeply biblical. My uncle, Carl Scovel, a Unitarian minister, attended the March on Washington in 1963 and heard King and others speak. He said to me it was striking how biblical King’s rhetoric sounded, far more so than any of the other speakers. Hewing stone comes up a lot in the King James Bible. King may not be thinking of any particular passage, but there are several that he might have had in mind. Moses is commanded by God to hew two tables of stone that will become the Ten Commandments (Exodus 34:1-4), for instance. And Jesus is buried in a tomb hewn out of the rock, with a stone rolled in front of it (Matthew 27:59-60). The Temple in Jerusalem is built by the workers of David and Solomon hewing stones out of the mountain (1 Chronicles 22, 2 Chronicles 2). The language of the King James Bible, its word choices, its rhythms and patterns of speech, have been a part of American public oratory for the country’s entire history, especially, though not exclusively, among African Americans. (Lincoln’s speeches were highly biblical.) Appropriately, at the inauguration of American’s first African American president, Barack Obama, the Rev. Joseph Lowry repeated the verse from Amos’s prophecy that was so important to Martin Luther King. In his benediction, Lowry looked forward, as King had done, to the time “when justice will roll down like waters and righteousness as a mighty stream.” That final time of Justice might not yet have arrived, but Lowry must have been thinking that at least some of those waters had rolled down since 1963. King had looked down the Mall toward the Capitol as he shared his dream of racial equality, but Lowry, and Obama, looked back the opposite way from the steps of the Capitol itself. There is more to books than just the texts they contain. Books are historical artifacts whose physical makeup and features tell us something about the people who owned them and the cultures that produced them. In this way, each book has its own story to tell. I was astonished. 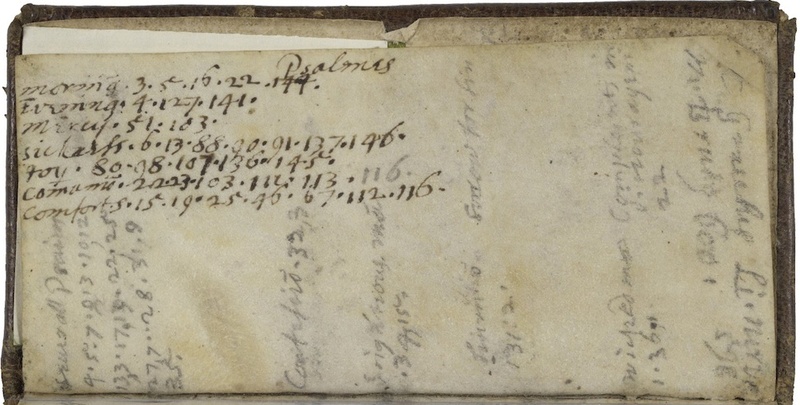 While many book owners from the early modern period inscribed their names into their books and perhaps even supplied a date, very few provided such personal details. We not only know who owned this book but where he kept it and where he took it. While it is taken for granted that small books often traveled in the pockets of their owners, it is wonderful to have confirmation from a contemporary owner. Also through the diary I learned of the Isham family’s close relationship with the Stuteville family. In the back of Isham’s Bible is a manuscript IOU contract between sisters Susan and Elizabeth Stuteville. Another interesting feature of the book is the manuscript index to the Psalms found in the book’s blank endpapers. Here Isham records the numbers of particular psalms appropriate for particular occasions: morning, evening, mercy, sickness, joy, communion, and comforts. The Psalms section of the book is also where he wrote the most manuscript notes. I continue to be amazed by the amount of history contained in this one, small book. It really is one of the treasures of the Folger. I must admit it’s my favorite book in the exhibition. 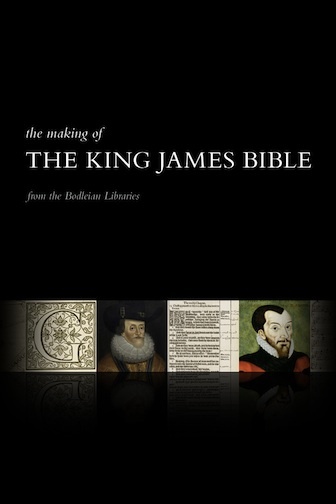 The Bodleian Library’s first app, ‘The Making of the King James Bible’, is now available to download for iPhone, iPad and Android devices. The narrative and content were conceived and written by the curators, with valuable input from colleagues at the Bodleian Library and others. 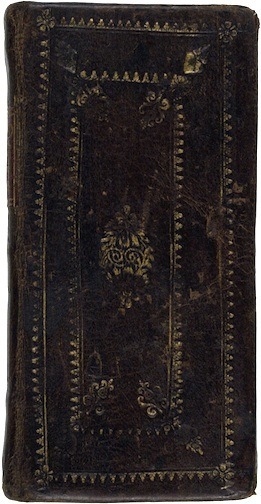 From the earliest days of planning, the Bodleian’s ‘Manifold Greatness’ exhibition has had a strong narrative focussing on the KJB’s links to Oxford and the material culture of the translators’ time, particularly in the form of the books connected with the translation that survive in Oxford libraries. This narrative transferred well to a digital environment, allowing us to create an app that would both enhance the experience of visitors to the Bodleian and provide a coherent and enjoyable digital encounter for those further afield. For me as a writer, one of the most interesting aspects of this process (my first taste of app-writing), was the three-dimensional and interactive way in which a story, images, sound and information can be presented in an app. Architectural and skeletal metaphors kept occurring to me as I worked on it. Like chapter headings in a book, the main menu supports the whole structure, and articulates the narrative of the app in miniature. But thereafter, the structure of the app becomes much less linear, as independent narratives branch out from the spine of the ‘Manifold Greatness’ story. The important role accorded to images and sound in an app, and the way they interact with text, has been another fascinating aspect to the project. It certainly reminded me that the interaction of text and image has always been a key element in the physical process of Bible reading. 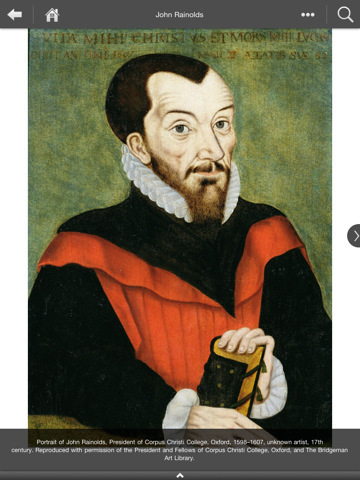 The artist who illustrated the Old English biblical poems in MS Junius 11; the creator of the woodcuts used in the Geneva Bible; or the cartographer John Speed, whose maps of Canaan were included in the 1611 KJB, all have an important role to play in the history of biblical reception. (These images can be viewed in the app). Helen Moore is Fellow in English at Corpus Christi College, Oxford, and chaired the Oxford ‘Manifold Greatness’ curatorial committee. 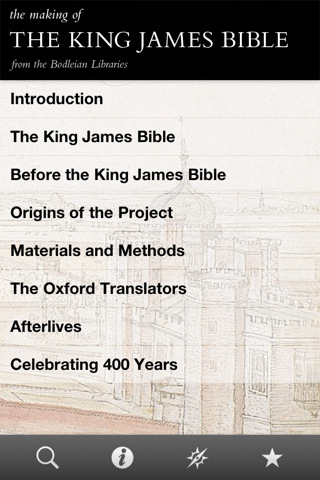 It’s hard to envision what the original King James Bible translators would have made of it, or exactly how one would even begin to explain it to one of them if a time machine were available, but the Bodleian Libraries have just released their first mobile app: “The Making of the King James Bible,” available for iPhone, iPad, and Android-based devices. 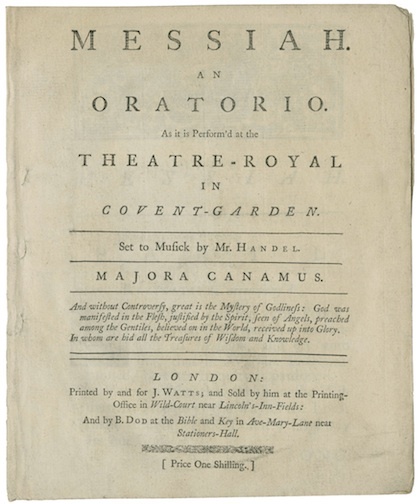 Among numerous highlights, including images of many items from the exhibition, the app includes comments from the Oxford curators, readings from the King James Bible translation, and Evensong performed by the choir at Corpus Christi College. Blake, Marriage of Heaven and Hell, c 1790-93. Fitzwilliam Museum, Cambridge. Bridgman Art Library. William Blake, who died on August 12 in 1827, was one of English literature’s most eccentric poets. Even the word “poet” doesn’t fit him very well, since he was also a painter, an engraver, and a printer, and many of his works were really multimedia productions, with words, images, and designs all working together to one aesthetic effect. Blake was also a radical in politics and religion, resisting hierarchy, authority, and inequality wherever he perceived it, in the State, the Church, or the Book of Genesis. Blake was a religious poet who strove to overturn traditional religion, a biblical writer who rewrote the Bible. The God of Genesis, for Blake, was an authoritarian tyrant, and Satan’s rebellion against him was not sinful but heroic. For Blake, who considered himself a Christian, Christianity was about forgiveness, not morality. And forgiveness did not depend upon God or the Church but was to be exercised by everyone. True divinity was within every individual. Blake’s use of what today we would call prose poetry, borrowed from the lines of Isaiah and Jeremiah in the King James Bible, influenced the similar styles (if different thinking) of later American poets Walt Whitman and Alan Ginsberg. 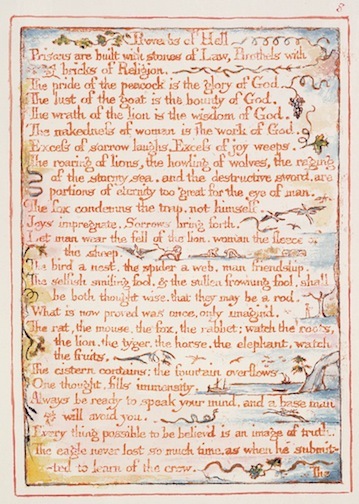 In fact, Blake’s reputation as poet and artist is considerably higher in the twentieth and twenty-first centuries than it was in his own day, perhaps partly because his rare, hand-printed and -colored works can now be widely reproduced. 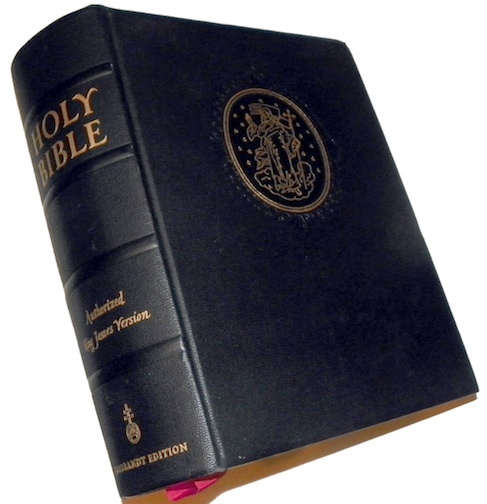 Read more about the influence of the King James Bible on a variety of literary works in the Literary Influences timeline on the Manifold Greatness website.